Smart Sensor Market size was over USD 20 billion in 2015, with shipments set to grow at over 17% CAGR from 2016 to 2024. Favorable government initiatives, advances in the consumer electronics and aerospace & defense industry, coupled with the rising trend of miniaturization are driving the overall smart sensor market. Government administrations globally are increasingly investing in smart technologies on a large scale. Manufacturers are adopting the miniaturization trend by offering flexible mounting options, small sensor sizes and incorporating several functionalities in a single chip. Emergence of trends such as smart home and smart cities will provide lucrative growth opportunities for the smart sensor market size. The devices are used for functionalities such as effective monitoring, lighting systems and are integrated in security and surveillance systems which are critical part of connected technologies. Furthermore, the active government participation by investing lump sum amounts for smart cities market development will further contribute towards the industry growth. The smart sensor market is showing a noteworthy effect in meeting the environmental challenges. The devices aid in reducing the carbon emission levels. Therefore, they are widely adopted in coal power plants to efficiently manage the processes. Smart position sensor market share is anticipated to witness substantial growth over the forecast timeframe owing to growing adoption across the automotive and aerospace industry. Developments in industrial robotics sector is helping drive the demand. Touch sensors will witness growth owing to the escalating usage of touch enabled displays. The inclination towards digitalization and increasing demand for tablets and smartphones incorporated with advanced touch enabled displays are prime factors impacting the segment growth. Furthermore, the active R&D activities to improve the sensitivity will propel the smart sensor market demand. MEMS technology is expected to grow at a CAGR of over 15% from 2016 to 2024. Growth of IoT and rise in usage of wearable technology such as smartwatches will likely push the MEMS technology demand in the smart sensor market. The technology is broadly being implemented in airbag systems for the automotive industry owing to the government regulations related to driving and growing fears for passenger safety. Increasing proclivity towards smart home services to help minimalize the healthcare costs, nursing wearables technology will help generate the technology demand over the future. The rising inclination towards residential monitoring services to minimize the hospital costs and health monitoring wearables will further fuel sales. The wireless networks in the smart sensor market will witness a significant growth due to high speed coupled with cost efficiency, as they do not necessitate the need for infrastructure. Moreover, rising adoption of wireless networks in commercial spaces in order to eliminate the disruptions made in wired networks will propel demand. The inability to support large number of devices will further decrease the demand for wired networks. Wired network demand will also be hampered by the cost curtailed in establishing the infrastructure. In addition, the speed offered by these products is lower than their counterparts. Residential applications including home security, and energy management is anticipated to grow significantly in the coming years. Smart sensor market use cases include security devices for the purpose of alerting the residents in case of emergencies such as fire or theft. Image sensors are integrated with the doors to keep a check on the visitors entering the house. Aerospace & defense applications will further witness high demand. The industry requires a variety of chemical sensing technologies to screen conditions in space in aircraft or spacecraft operations. For instance, in the recognition of fire conditions of aircrafts and spacecraft, they are used for the measurement of elements such as carbon dioxide, carbon monoxide and oxygen. APAC smart sensor market size is anticipated to grow significantly due to the growing establishment of manufacturing industries and rapid industrialization. Strong economic development across China, India and Japan is helping to contribute to the global revenue. The consumer inclination towards energy conservation and wireless technology has augmented adoption in the energy management or monitoring devices. The capabilities such as self-diagnosis and self-calibration will also fuel the regional growth. The trend towards the miniaturization and flexibility are making these products effective in the consumer electronics and wearable devices, driving the Europe smart sensor market size. 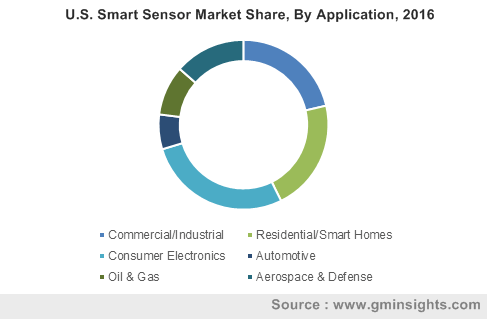 The smart sensor market share is composed of companies such as ABB., Analog Devices, Atmel Corporation, Eaton Corporation, Emerson Electric, General Electric, Honeywell, Infineon Technologies, InvenSense, Legrand S.A., NXP Semiconductors, Robert Bosch, Sensirion, Smart Sensors. and TE Connectivity. The escalating drift towards the need for smart cities and homes is compelling the manufacturers to develop products appropriate for such applications. For instance, in March 2017, General Electric announced that it will be providing sensors to be integrated in traffic signals, street lights, and roads to gather insights on traffic and crime as an initiative towards smart city development in San Diego. 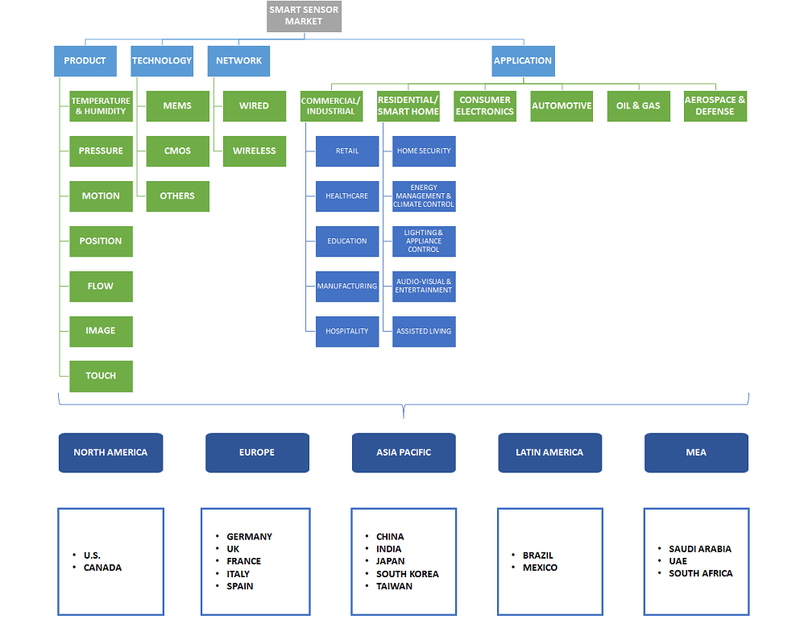 Several designers and manufacturers are participating in recurrent mergers & acquisitions to expand their reach globally. In 2016, Microchip Technology Inc. acquired Atmel Corporation to expand their expertise in the industry. The overall smart sensor market is displaying profitable growth over the forecast timeframe with growing application in several industries, acceptance of technologies such as MEMS and advancements in technologies for end-user segments.